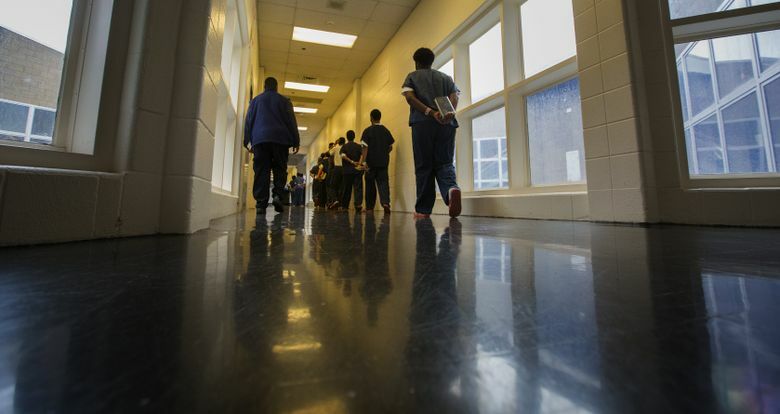 Washington state should phase out the use of juvenile detention for truants and runaways, an outdated practice that experts say is more likely to traumatize kids than improve their behavior. Washington state should end the use of juvenile detention for truants and runaways, an outdated practice the state has leaned on for too long. These children have committed no crime. Yet Washington judges still sent them to detention cells 1,781 times in 2016. While these numbers show some statewide improvement when compared to the most recent federal data, they still suggest Washington jails kids for noncriminal offenses far more often than other states. About half of states report they never detain kids whose only offenses are skipping school or running away. Juvenile-justice experts agree that throwing these kids in detention cells can traumatize them and cause them to act out more instead of less. Ending the use of detention in these cases is good policy the Legislature should embrace. A proposal from state Sen. Jeannie Darneille, D-Tacoma, would do just that. Senate Bill 5596 would phase out the use of detention in truancy cases by July 2019, while banning detention of runaways by July 2020. This staggered timeline would give the Legislature time to set up alternative placements for kids who run away from home — a crucial piece of the puzzle that lawmakers can’t ignore. Judges need other places to send a child in crisis besides a cell or back to the streets. In the past, this is where the state has failed to deliver. When legislators passed the Becca Bill in 1995, they hoped the law would help connect troubled youths with much-needed services. The idea was that judges would use detention only as a last resort, or in rare cases when they feared for a child’s safety. But lawmakers have fallen short in actually stepping up with money for interventions. Too many of the state’s 39 counties still lack beds in crisis residential centers, alternative shelter facilities that are geared toward getting runaways the help and counseling they need. The state has done a good job in recent years steering kids who skip school away from the court system, mainly by expanding interventions such as community truancy boards. They need to build upon those efforts while ensuring runaways and their families get similar support services. That means boosting funding for evidence-based strategies such as functional family therapy — an intervention that works but that not all counties can provide right now. To phase out noncriminal youth detention by the deadlines in Darneille’s bill, lawmakers can’t wait. They must find some money this year to invest in these essential services. A good start would be to pass another of Darneille’s proposals, Senate Bill 6467, which would add secure crisis residential center beds in three of the counties that detain the most noncriminal kids. That bill would cost the state less than $2 million a year, a minuscule amount in the context of the state’s $43.7-billion biennial budget. Lawmakers should make a commitment today to stop jailing kids whose only crimes are skipping school or running away. They then must follow through with resources to ensure these children finally get the support they need.